Completely renovated in a contemporary style and Art-Deco, the hotel Montaigne & Spa offers you a 4 star welcome in an intimate atmosphere that meets your expectations. Located in the centre of Cannes, a stone's throw from the 'Palais des Festivals', the Croisette and its beaches, and from the famous rue d'Antibes for a shopping experience, the hotel Montaigne & Spa welcomes you for an unforgettable stay on the Cote d'Azur. 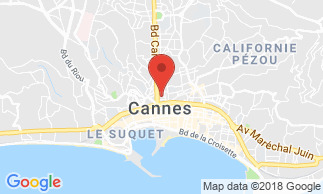 Located close to the public transports (train, airport and taxi) you will be able to visit Cannes and its surroundings without the stress of driving. You will enjoy the multiple services offered by the hotel: the restaurant offering an authentic cuisine, the patio, a paradise of greenery, and the spa with its customized treatments, for a moment of well-being and relaxation around the indoor pool, the jacuzzi and the hammam. The hotel has 96 rooms and suites, all decorated in a style that combines modernity, comfort and elegance. The Hotel Montaigne & Spa offers 96 rooms and suites, all decorated in a style that combines modernity, comfort and elegance. Most of the rooms have king size beds 200*200 (twin beds on request), a private bathroom with shower or bathtub with relaxation jets or traditional bathtub, hairdryer, bathrobes, toiletries and slippers or flip flops for the indoor pool. They are also equipped with air conditioning, minibar and safe, a work area with desk, blackout curtains, free Wi-Fi access, telephone, HDTV 32'' with 100 national and international channels. Restaurant: Discover a traditional cuisine with the flavors of the Mediterranean. The Chef and his team promise you an exceptional culinary experience by offering products coming directly from Italy and the Forville market, the local market of Cannes. Open every evening except Sundays and Mondays. SPA MONTAIGNE: 250 sqm of top-of-the-range facilities, with indoor swimming pool with counter current, jacuzzi, hammam, treatment rooms, beauty area, fitness and cardio-training. Indoor pool of 11 m * 3.5 m. The swimming pool is open from 7 am - 9 pm, except for minors under 16 years old (from 7 am- 9 am and from 7 pm - 9 pm). Seminars: The air-conditioned and soundproofed meeting room of 80 sqm offers natural daylight and is equipped with a large HD screen and two additional screens, as well as a very high speed Internet access and all necessary equipment for a professional meeting. The Hotel Montaigne & Spa is located just 450 metres from the beaches, the famous Croisette, and the shops of the famous Rue d'Antibes. Buffet breakfast is served in the restaurant from 7 am - 10 am.